The former first lady is currently touring the country promoting her memoir, "Becoming." 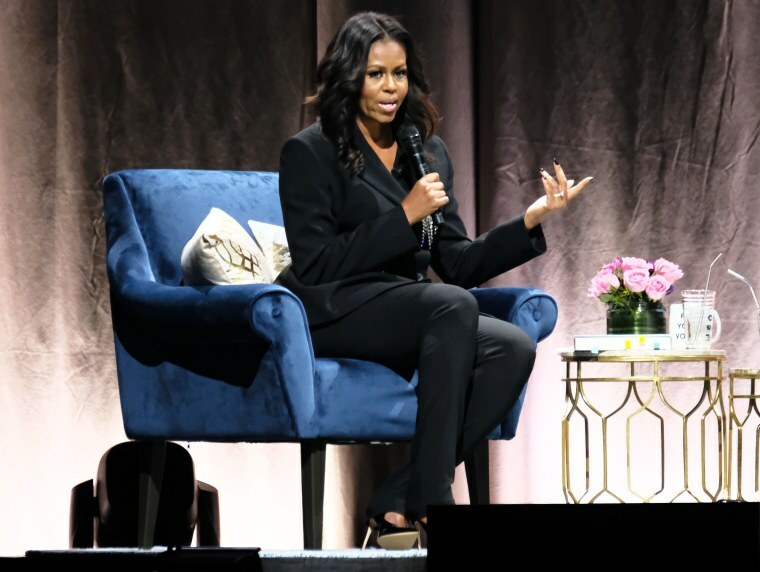 WASHINGTON — Former President Barack Obama practically brought the house down at Michelle Obama's book show in Washington. The former first lady is currently touring the country promoting her memoir, "Becoming," and participated in a conversation Saturday night moderated by her longtime friend and former Obama White House adviser Valerie Jarrett. When the conversation shifted toward Mrs. Obama's feelings about her husband, Jarrett announced a "special guest" and Barack Obama came on stage carrying a bouquet of pink roses for his wife. The crowd at Capital One Arena leapt to its feet. Jarrett asked him what about Michelle Obama captured his heart when they met at a Chicago law firm where she was his mentor. Barack Obama said she was "one of a kind," strong and honest, and someone he knew he could always count on. He also said he knew that if she was the mother of his children their offspring would be "extraordinary."